These are good times to be a birder in temperate climes. The mass migration of spectacular songbirds, shorebirds, and raptors, many of whom those of us who dwell north of the equator haven’t seen in months, is quite simply the premiere birding event of the year. May is like a Christmas morning or Mardi Gras we can celebrate all month long, like a Super Bowl that doesn’t become a blow-out by the third quarter, but actually lives up to the hype…and lasts all month! If I may steal a corny, old line from Baskin Robbins, the purveyor of classic ice cream flavors like Rocky Road and Pink Bubblegum, we are in the midst of thirty-wonderful days of high avian enjoyment. This season is not without its drawbacks. For those of you locked up indoors by the overwhelming demands of work, family, health, or ennui, cut off from the merry warbling of warblers, it’s easy to romanticize spring migration. One might imagine that all a person needs to do is meander outside and start ticking off the hundreds of species lining up obediently at eye level for accurate identification. Every bird is, of course, a male in full breeding plumage, delivering its complete song note for note as the textbooks describe. As attractive as that rendition of spring migration sounds, it’s hardly realistic. For one thing, the birds aren’t all male, so ID isn’t always that simple. Most of us have trouble matching the jumble of eye stripes, throat patches, wing bars, and chest patterns that spring birds deliver at rapid speeds. And it isn’t as if these migrants are all lollygagging on lawns and bird feeders; many of them are perched way up above it all, hopping frenetically from branch to dim, backlit branch. The old hands call it ‘warbler neck’ for a reason. So, while I and my blogging colleagues will do our best to chronicle the high points of spring migration, complete with impressive day lists and sharp, full-color photographs, I want to take a moment to share one of the myriad frustrations of the season: trying to identify a vague, bird-like object flitting through the upper reaches of the canopy. Exhibits A and B are two photos of an indistinct passerine. This bird offers just enough detail to make me think I know what it is, while withholding any field mark that might lead to a conclusive identification. Care to try your hand? This is, after all, part and parcel of a glorious spring migration! This bonus bird, affectionately labeled Exhibit C, caused me no end of frustration, seducing me with a saucy crescent-shaped eyebrow before resolving into a surprise species. If you recognize this bird at a glance, you’ve no doubt been down that same sorry road. That is certainly true. There are many birds that I just have to let pass because my look is too fleeting or the angle is too steep for me to get an identifiable look. I face less of that now that I depend more on songs for identification, but I still have plenty of unidentified avian objects. I hope I am not killing the suspense for anyone, but I’ll take a shot at the photographs. A+B are red-eyed vireo. 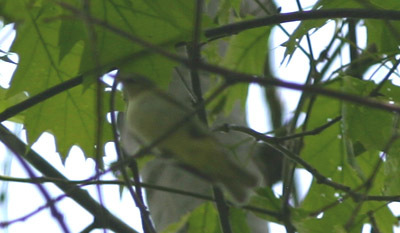 C is a little tougher because of the angle, but I think it’s a Tennessee warbler with stronger than normal facial markings. I’ll leave C alone–but I too think vireo for A and B–but not necessarily Red-eyed…. Believe it or not, Charlie, I actually set the ISO on Exhibit C. The first two shots had to serve in lieu of binoculars since I foolishly left them behind! Charlie is correct on Exhibit C. It is a female Black-throated Blue in what I believe is first year plumage. Exhibits A & B are clearly a vireo, but I’m stumped beyond that. 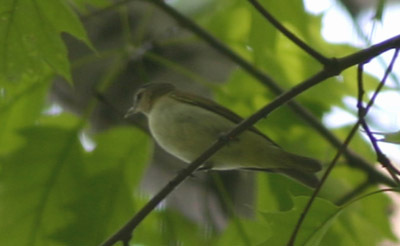 I really think the bird is a Philadelphia Vireo, but since I’ve never seen one before, I’m hesitant to make the call. Red-eyed is way more common here. Is anyone else more confident about that ID based on these dim photos? On A&B, I think your tentative ID is right: Philadelphia Vireo. Vireo shape + yellow underside + no wing bars is pretty much conclusive. No eastern Red-eyed should have a yellow belly. Red-eyeds are white underneath. I’d call that bird a Philadelphia, and I’d feel reasonably confident reporting it as such on the birding mailing-lists I belong to. 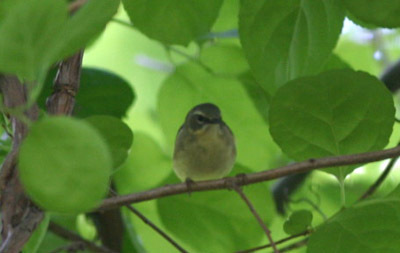 Now that you mention Philadelphia vireo for A+B, I think that you are right. It is clearly more yellow than a red-eyed should be, and the tail is too short. Plus I notice that the facial markings are not quite what I would expect from a red-eyed. Nice sighting!